1984’s Revenge of the Nerds didn’t need a sequel. Everything gets accomplished in that movie. It could have stood alone as a piece of history. A treasured work of art that we could look back on and admire. In making a followup film, you risk losing the quality and integrity of the predecessor. Of course, hindsight is 20/20. Before sequels typically had any chance of being good, the filmmakers of Revenge of the Nerds decided to take this risk. While critics back then may have been less than pleased, true fans probably enjoyed seeing more nerds. What makes Revenge of the Nerds so great isn’t only its goofy premise, but mostly its incredible characters. And when you like the characters, it makes an unnecessary sequel more justifiable. However, these characters don’t always live up to their full potential in the sequel. Some fan-favorites from the first film are missing, and that messes with the dynamics a little. Lewis and the rest of the nerds in the Lambda Lambda Lambda fraternity head to Florida for a national fraternity convention. They’re met with harsh adversity when their rivals in the jock fraternity get offended by how the nerds are ruining the cool vibe of the convention. Their incentives aren’t exactly crystal-clear, but neither are they in previous film. Fortunately, you can make a case that it’s even funnier than its predecessor. There are some bits that are even more clever, and less focus on sexcapades. And in an unexpected twist, the film holds up just as well. Full House is one of my favorite television shows of all time. The nostalgia that exudes from the screen every time I watch it is almost unparalleled. But when making a Lifetime movie about all that happened behind-the-scenes, you have to expect a below average product. Honestly, I didn’t hate it. The made-for-TV-movie happens to hit on what Full House was all about for their audience–escaping our lives temporarily to watch a family that we knew would make it all work out in the end. Full House was far from a technically superb show, but America loved it for some strange reason. It spoke to us, and it had it’s own distinct character to it. But other than fans watching their childhood being made significant with the production of a “biopic”, this film is poorly made, thus written off as laughable. 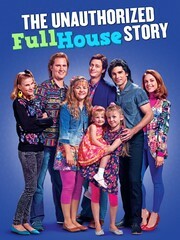 While hardly scratching the surface, The Unauthorized Full House Story gives little depth to what happened off-camera. It provides necessary details of what occurred over a 10 year period for nearly a dozen characters, but doesn’t make the conflicts mean anything. But honestly, I don’t think that’s what is making people write this one off. I think it’s the fact that every little missed detail is annoyingly distracting us from becoming convinced of this world that the filmmakers have created. We want to get sucked in and experience all the happenings of the people we so fondly grew up with. And that’s what a biopic is all about–being convinced. But the main actors–other than the girl who played the young Candice Cameron–were ever so inaccurate with their portrayals. Bob Saget comes off as whiny, John Stamos appears to be a prude, and the Olsen twins aren’t nearly as precocious as they were famously known to be. We have a hard time imagining the actors playing the characters, therefore taking away from the “magic” that is supposed to be present here. In fact, after lines were delivered, I spent a lot of time stopping to imagine the actual person saying them. Also, almost nothing about this film feels like it’s set in the ’80s or ’90s. From the first scene, when we see a pre-fame Saget delivering jokes in a comedy club, the camera flashes to the audience who is dressed as if it were 2015. At least make us FEEL like we’re there! But let’s face it, most likely we’re not going to get a feature film biopic directed by Steven Soderbergh and starring a handful of household names. This is pretty much as good as we’re going to get outside of an actual documentary or the followup series being delivered sometime in 2016.